The journal “Business Studies”, published by The University of Business Studies Banja Luka, is a publication that comes out once a year. The journal has a general orientation. It publishes original scientific papers, preliminary communications, scientific reviews, preliminary reports, professional papers and book reviews. Only original work that has not been previously published or already given for publication elsewhere can be submitted. The papers should be prepared in accordance with the Instructions for the Journal “Business Studies”. 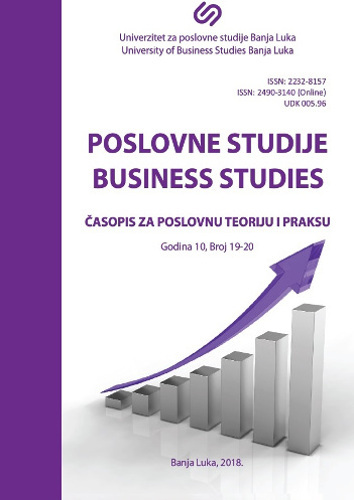 The Journal “Business Studies” is classified in the first category (34 points) by the Commission for Classification of Scientific Publications of the Ministry for Scientific and Technological Development, Higher Education and Information Society of the Republic of Srpska. The journal is registered in EBSCO and ERIH PLUS database. Thus, scientific papers published in the journal,, Business Studies ” are available to the scientific public worldwide. The journal is also indexed in the SJIFactor (SJIF Scientific Journal Impact Factor) and evaluated by the impact factor of 6,885. Additionally, it is indexed into doisrpska.nub.rs, scholar.google.com, road.issn.org, It is submitted for reference to other international databases. Call for submission of papers for the journal Business Studies is open from 05/02/2019 to 05/05/ 2019.